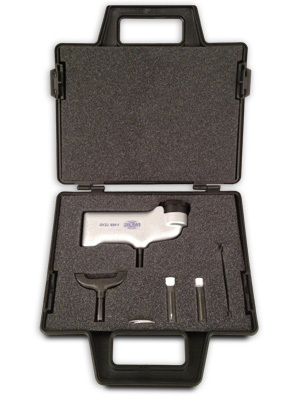 The Impressor is a convenient tool for testing the hardness of aluminum, aluminum alloys, copper, brass and other materials including plastics and fiberglass. The instrument is designed for use on fabricated parts and assemblies as well as on raw stock. Easy to Use - No experience required; can be used in any position and in any space that will allow for the operator’s hand. The hardness reading is instantly indicated on the dial, which is divided into one hundred graduations. No waiting, preloading or separate measurements. Lightweight - The Impressor weighs only 1 lb. 2 oz. and comes complete with carrying case, adjusting wrench and two spare indenters. 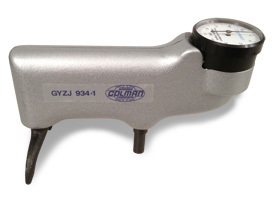 GYZJ 934-1 Use this model for fiberglass, soft metals such as aluminum and its alloys, brass, copper, and some of the harder plastics and fiberglass. Approximated range 25 to 150 Brinell (10mm ball 500 KG load). This unit meets American Society for Testing and Material (ASTM) Standard D-2583. GYZJ 935 Use this Model for the softer plastics and very soft metals. Approximate range 50 to 110 Rockwell "R". 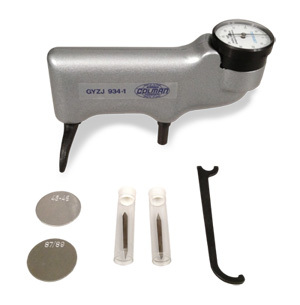 GYZJ 936 Use this Model for extremely soft materials such as lead, linoleum and leather. 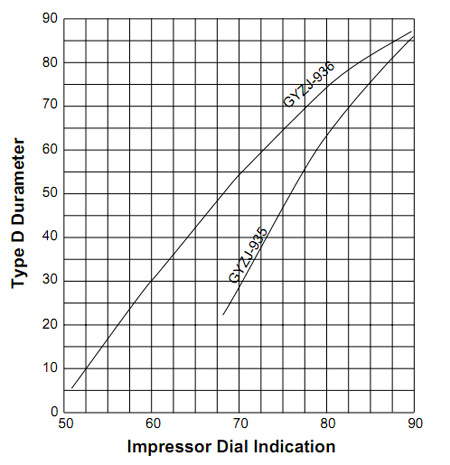 The Impressor is best suited for testing homogeneous materials. Material of granular, fibrous or coarse structure will produce a wide variation in hardness readings because of the small diameter of the indenter point. 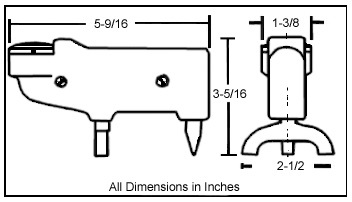 For accurate readings, material should be at least 1/32" thick and large enough for a minimum distance of 1/8" in any direction from the indenter point to the edge of the specimen. The testing area should be smooth and free from mechanical damage. Simply exert a light pressure against the instrument to drive the spring-loaded indenter into the material. The indenter must be perpendicular to the surface being tested. On very soft metal, the highest reading should be used since cold flow permits the spring-loaded indenter to continue penetration. Note: Physical characteristics of very soft materials are such that uniform correlation between different hardness measuring systems cannot be established. For this reason, no conversion curves are offered for the 935 and 936 models. 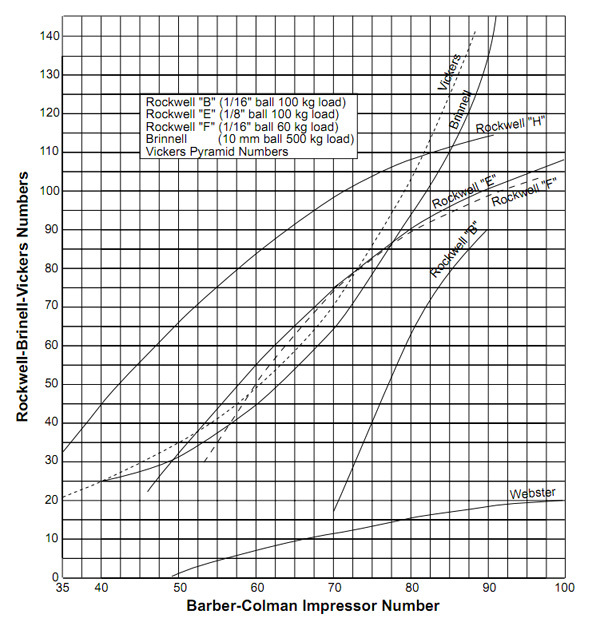 We recommend that Impressor hardness limits for each material be established by test.